← To: Paulos, my man! If I told you Jesus was not the only Messiah in the bible, would you get upset with me? If I told you that I could prove it, would you put you hands over your ears and refuse to listen? If I could show you in the text that Jesus was not the only Messiah, would you be confused? Would you be hurt? Would you be angry? Would it be an excuse to throw away your faith? I want to encourage people to study – to do more than read the text with a cursory glance or wait for their pastor to do their exegesis for them. Isn’t Jesus Christ the Messiah? The framing of this question above points out a couple of things that need to be addressed before we can go any further. 1. Jesus Christ is not the name of our Savior. Christ is an adjective, not a last name. 2. The name of Jesus in the Hebrew was Yeshua ben Yosef (Jesus son of Joseph). There was no last name. Last names didn’t come into existence until much, much later. 3. Christ is the English rendering of the Greek word Christos. 4. Christos is the Greek rendering of the Hebrew word Mashiach (Messiah). Isn’t Jesus Messiah the Messiah? Or Isn’t Jesus Christ the Christ? Isn’t Yeshua ben Yosef the Messiah? Or Isn’t Jesus son of Joseph the Christ? Why does God call a pagan King that worships more than one god – that worships gods other than Him, His anointed? A more difficult question would be, Why does God call Cyrus (Koresh) mashiach (messiah)? WAIT-JUST-A-COTTON-PICKIN-MINUTE! Where does it say that?!? Simple – In the first line of the first verse. Derived from māshach (HED #5066), “to anoint,” māshîach has cognates widely attested in Northwest and South Semitic. The noun most often refers to the reigning king of Israel as the Lord’s “anointed one” (1 Sam. 24:6, 10; 2 Sam. 1:14; Ps. 20:6; Lam. 4:20; Hab. 3:13), synonymous with “king.” Anointing rituals set the subject apart for special service before Yahweh. However, with reference to the Davidic dynasty, it clearly had a future messianic ideal that went beyond the national king (2 Sam. 22:51; 2 Chr. 6:42; Pss. 18:50; 132:10, 17). The Lord’s “Anointed” in Ps. 2:2 can hardly be anything other than a direct reference to the future “Messiah,” since the same Psalm also instructs people to put faith in this Son (v. 12). Furthermore, “Messiah” is almost surely a reference to Jesus Christ in at least two other verses (Dan. 9:25f). While some scholars reject this assertion, they generally base their rejection of a future “Messiah” on a questionable interpretation of Dan. 9:26. They claim that “the Messiah [who] will be cut off” was a second century b.c. high priest (cf. TWOT). However, there is strong evidence on the basis of Dan. 9:24 that this “Messiah” is indeed Jesus Christ. It is true, on the other hand, that this term is used as the title of the coming Son of David primarily in the NT. The patriarchs of the OT were regarded as “anointed” of Yahweh (1 Chr. 16:22; Ps. 105:15). Māshîach even referred to a pagan king, named Cyrus, as the Lord’s “anointed” (Isa. 45:1). Since this use obviously does not denote righteousness or godliness on the part of this idol worshiper, it almost certainly speaks of Cyrus as the Lord’s “chosen one” for the task of delivering Israel from the Babylonian captivity. Finally, māshîach can refer to the high priest of Israel (Lev. 4:3, 5, 16; 6:22). Thoralf Gilbrant, ed., “5081,” in The Complete Biblical Library Hebrew-English Dictionary – Kaph-Mem, (Springfield, IL: World Library Press, Inc., 1998), WORDsearch CROSS e-book, Under: “5081”. You see, mashiach (messiah) as it is in the Hebrew, or christos (christ) as it is rendered from the Hebrew in the Greek, denotes someone that anointed by God to do His bidding. The text tells us that Cyrus (Koresh) the polytheistic king was anointed by God to do his bidding. Cyrus II became the king of all Persia, beginning as the ruler of a small territory known as Anshan. He was born in 590 b.c. By 550 he had conquered the kingdom of Media, claiming most of western modern Iran. By 547 he had conquered most of Anatolia, and by 540 he controlled the rest of the Iranian Plain. Within a year, he conquered the Neo-Babylonian empire as well. Cyrus died in battle against a tribe in Iran in 530. The empire which he had established before his death was the largest that the ancient Near Eastern world had known. 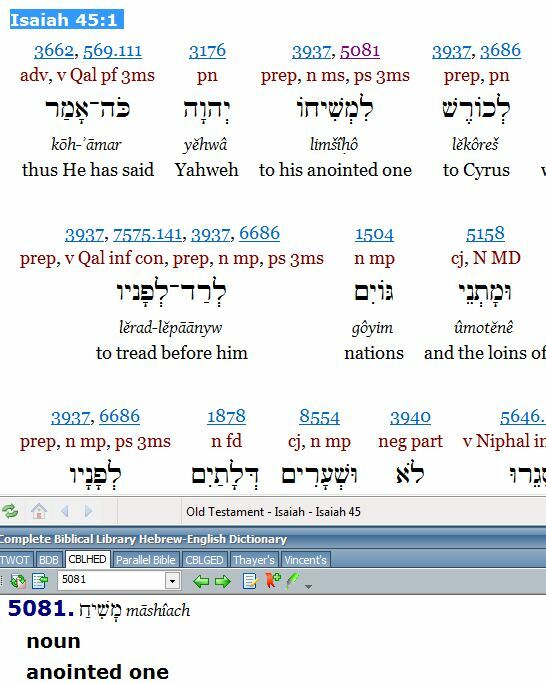 Cyrus bears the label māshîach (HED #5081), “the anointed one” of Yahweh (Isa. 45:1). Yahweh, demonstrating his control over all peoples, raised him up to rule the world, so that the Judahites might be freed from their captivity in Babylon (v. 15). Indeed, Cyrus did issue a decree which did allow all peoples, including the Jews, to return to their homelands, and return to their native cultural environment as well. All property seized as booty by the Babylonians was to be returned. Further, the royal treasury was to provide the means by which these subjects were to reestablish their homelands. Thoralf Gilbrant, ed., “3686,” in The Complete Biblical Library Hebrew-English Dictionary – Kaph-Mem, (Springfield, IL: World Library Press, Inc., 1998), WORDsearch CROSS e-book, Under: “3686”. Without a doubt, in changing his name to David Koresh, he was making allusions to being messiah – anointed of God. Crazy – undoubtedly. Did he know the biblical text? At least in this area he did. This is why it is so important to know the biblical text. Yeshua (Jesus), when he was tested 3 times by the Adversary, used the text to rebuke Satan’s attempts to tempt Him. He used the Jewish bible to do it – the Tanakh. There was no New Testament at the time. We would be wise to follow all of the examples that He gave us – they have reason and purpose in them. From washing feet, to the last supper to baptism, these were Jewish things that were done by our Jewish Savior. We would be wise to understand the Jewish roots of the Christian faith. 7 Natan said to David, “You are the man. ‘I anointed you king over Isra’el. I rescued you from the power of Sha’ul. The word used here in the Hebrew is mashiach (messiah)as well. When you understand this, you understand what christos (christ) means in the Greek. It is not a last name. It does not mean son of God. It means anointed. To be God’s mashiach (messiah) might be as a priest, or as a pagan polytheistic king or as a prophesied suffering servant that was “wounded because of our crimes and crushed because of our sins” known as Yeshua HaMashiach (Jesus the Christ) – anointed of God. This entry was posted in Word Studies and tagged anointed, christ, christianity, christos, cyrus, david koresh, even if, Jesus, koresh, mashiach, messiah, vernon wayne howell, Yeshua. Bookmark the permalink. 8 Responses to More than one Christ? You ask good questions and your parodies were quite good. I am not sure from your writings that I totally know where you stand in your world view but I enjoyed trying to figure it out. My worldview is simple – it doesn’t have “world” in it. It would be better to call it a Godview or a Yeshuaview or Messiahview. You can read part 2 of the Largest Church in America and it will explain using the text why my “view” doesnt have world in it. In it not of it or as I think better explains it: I live in it as a witness, not of it because my Lord is enough! The book I I have just written, got out of acountability group last month. It is now in editing and is called Even If . . . from Daniel 3:17-18 – It is about living a Chrstian life “Even If” and where God is central – where God is enough. We serve an AWESOME God!!! He is more than enough!!! Well said. I look forward to reading lots more of you.